Barcelona ace Lionel Messi is reportedly desperate to make a return to the squad for the Champions League clash against Inter Milan for reasons pertaining to the Ballon d'Or. The five-time Ballon d'Or winner was seen making a surprise return to the Barcelona training ground recently despite having sustained a fractured arm just a few weeks ago. 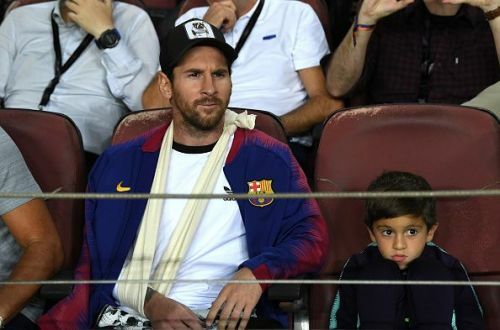 Barcelona had confirmed that Messi would be out for at least three weeks to recover from the injury he picked up during the side's LaLiga game against Sevilla on October 20. However, the Catalan giants have now decided to include Messi in the squad travelling to Milan on Tuesday for a Champions League clash. Barcelona revealed the names of the squad on Sunday and have admitted that the Argentine ace will travel to Northern Italy "without [the] medical all-clear". Manager Ernesto Valverde recently spoke about the return saying, "I think we all play better with Messi in the side. We will see how he is in training [on Sunday] with regards to the Inter game this week." According to AS, Messi is desperate to make his return in the game against Inter Milan to boost his chances at winning the Ballon d'Or. As the voting for the prestigious award closes on November 9, the Argentine ace is reportedly looking to prove himself for the last time before voting ends. The AS report reads, "It is unclear whether the Argentine will be able to start at San Siro, but all the indications are that he may well feature at some point of the Group B match." It further stated, "The voting for Ballon d'Or finished on November 9th and he is said to be keen to both fire Barca through to the next round and send out a message as to who the best in the world really is." Despite being included in the squad travelling to Italy, whether Barcelona will take the risk and feature their star player in the game remains to be seen.